Sometimes the simplest things are also the most elegant. 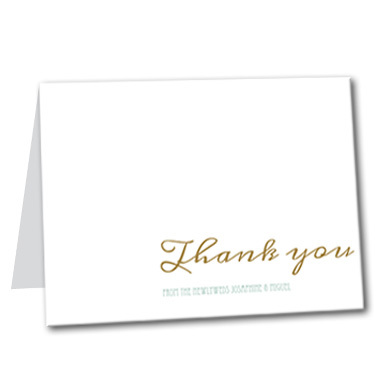 This Elegant Emerald thank you card is one shining example. It has a basic design with your choice of personalized message, combined with a dazzling emerald and gold color scheme that is sure to capture the attention of everyone on your guest list. You can even choose your favorite wedding font to make the look more reflective of your personal style. Elegant Emerald Thank You Card For the best experience, we recommend personalizing your stationery on a desktop computer.